Neuroblastoma can occur in many areas of the body. It develops from the tissues that form the sympathetic nervous system. This is the part of the nervous system that controls body functions, such as heart rate and blood pressure, digestion, and levels of certain hormones. Most neuroblastomas begin in the abdomen, in the adrenal gland, next to the spinal cord, or in the chest. Neuroblastomas can spread to the bones. Bones include those in the face, skull, pelvis, shoulders, arms, and legs. It can also spread to the bone marrow, liver, lymph nodes, skin, and around the eyes (orbits). The cause of the tumor is not known. Experts believe that a defect in the genes may play a role. Half of tumors are present at birth. Neuroblastoma is most commonly diagnosed in children before the age of 5. Each year there are around 700 new cases in the United States. The disorder occurs in approximately 1 out of 100,000 children and is slightly more common in boys. In most people, the tumor has spread when it is first diagnosed. The first symptoms are usually fever, a general sick feeling (malaise), and pain. There may also be loss of appetite, weight loss, and diarrhea. There may be a lump or mass in the abdomen. 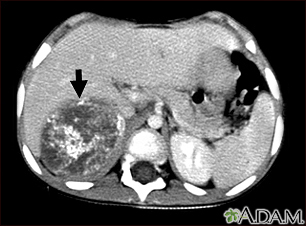 The liver may be enlarged, if the tumor has spread to the liver. There may be high blood pressure and a fast heart rate if the tumor is in an adrenal gland. Lymph nodes may be swollen. In certain cases, surgery alone is enough. Often, though, other therapies are needed as well. Anticancer medicines (chemotherapy) may be recommended if the tumor has spread. Radiation therapy may also be used. High-dose chemotherapy, followed by autologous stem cell transplantation, is being studied for use in children with very high-risk tumors. You can ease the stress of illness by joining a cancer support group. Sharing with others who have common experiences and problems can help you and your child not feel alone. Outcome varies. In very young children, the tumor may go away on its own, without treatment. Or, the tissues of the tumor may mature and develop into a non-cancerous (benign) tumor called a ganglioneuroma, which can be surgically removed. In other cases, the tumor spreads quickly. Response to treatment also varies. Treatment is often successful if the cancer has not spread. If it has spread, neuroblastoma is harder to cure. Younger children often do better than older children. Children treated for neuroblastoma may be at risk of getting a second, different cancer in the future. Call your health care provider if your child has symptoms of neuroblastoma. Early diagnosis and treatment improves the chance of a good outcome. Dome JS, Rodriguez-Galindo C, Spunt SL, Santana VM. Pediatric solid tumors. In: Niederhuber JE, Armitage JO, Doroshow JH, Kastan MB, Tepper JE, eds. Abeloff's Clinical Oncology. 5th ed. Philadelphia, PA: Elsevier Churchill Livingstone; 2014:chap 95. National Cancer Institute. Neuroblastoma Treatment (PDQ®) - Health Professional Version. Updated December 2, 2016. Cancer.gov Web site. www.cancer.gov/cancertopics/pdq/treatment/neuroblastoma/HealthProfessional. Accessed December 21, 2016.